Bayside Performance Park, located adjacent to a marina, would bring symphony shows to downtown waterfront. SAN DIEGO — Plans to build an outdoor music hall at the far corner of a downtown San Diego marina took one step forward on Dec. 11, as the Port of San Diego’s Board of Port Commissioners approved a formal document, overall concept and development permit necessary for the project to come online. The waterfront concert venue, known as Bayside Performance Park, would bring regularly feature the San Diego Symphony and other music-themed events in between Marriott Marquis Marina and Fifth Avenue Landing. San Diego Symphony, since 2004, had been hosting concerts on a temporary stage at the waterfront park. 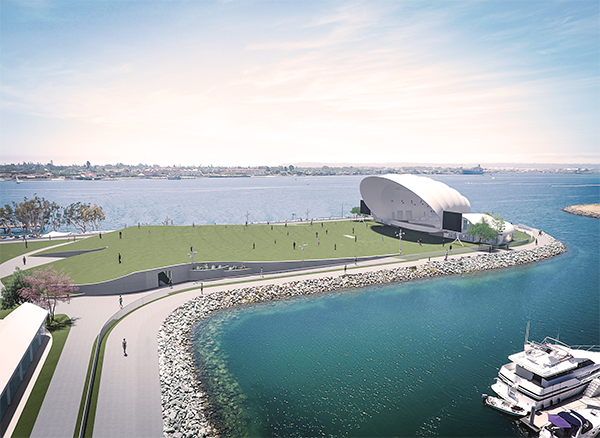 Bayside Performance Park would convert the area into a permanent outdoor music venue. Commissioners specifically formalized the project’s Port Master Plan Amendment (PMPA) and issued a conditional and non-appealable Coastal Development Permit (CDP). Adoption of the PMPA would allow the port district to address public access, park amenities and sea level rise adaptations. Issuing a CDP is part of the California Coastal Commission process. The Coastal Commission must sign off on the final PMPA before the waterfront concert venue could go forward. The park surrounding the concert venue would be open to the general public for 85 percent of the year. Port district staff added the concert venue would offer four free public events per year, including Memorial Day and Labor Day. The public would also be offered free admission to rehearsals, free educational events and reduced ticket pricing. Boaters at Marriott Marquis Marina and Fifth Street Landing could also take in shows from the water. Bayside Performance Park would be located at the port’s Embarcadero Marina Park South. The Coastal Commission extended preliminary approval of the project and will likely revisit the proposed outdoor concert venue at a meeting in 2019. Bringing Bayside Performance Park online would cost about $45 million, according to port district staff. The Symphony reportedly raised about $6 million, to date. Seating capacity at the new Bayside Performance Park would be about 10,000 people, almost double what the makeshift concert venue in previous summers. There will also be more events held each year. The Symphony, for 37 nights each year, put on a concert series known as Bayside Summer Nights. The new Bayside Performance Park would host 110 half-day or 55 full-day events each year. The Embarcadero Marina Park (north and south) area was built adjacent to the Downtown San Diego waterfront as part of a dredging project in 1978. Recreational and commercial boating activities frequently take place at and around the Embarcadero Marina South area. Bayside Performance Park’s outdoor concert venue would occupy about one-third of Embarcadero Marina Park South.